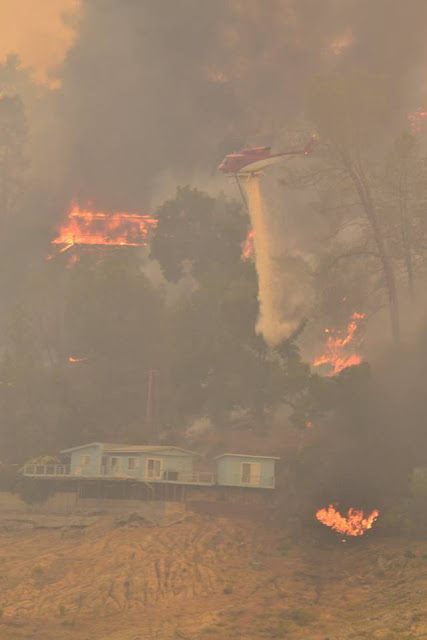 "no matter what fate chooses to play"
Jackson Browne "For A Dancer"
There is an emotional and intimate quality to Jackson Browne performances and coming on the night Cal Fire offered good news in the face of a tough battle it was even more so. 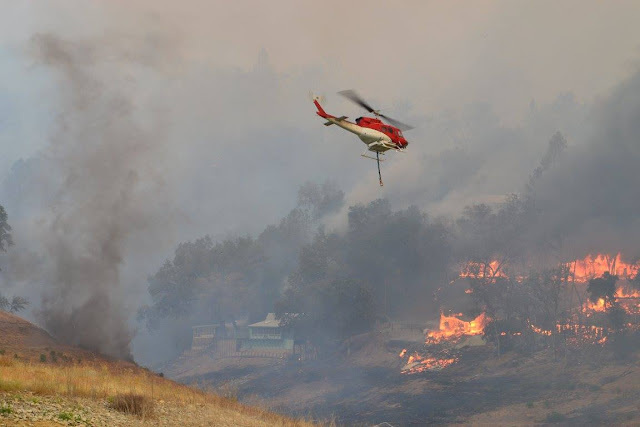 The good news is this-the Chimney fire is 51% contained and grew very little beyond the 45 thousand acres it has claimed. 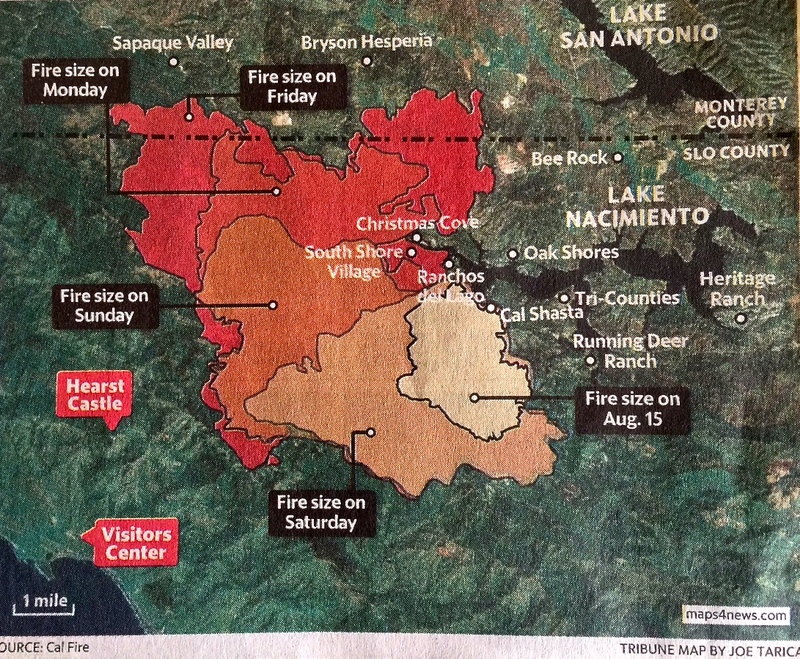 The Hearst Castle is still threatened however and 49 homes and 21 other structures have been destroyed. 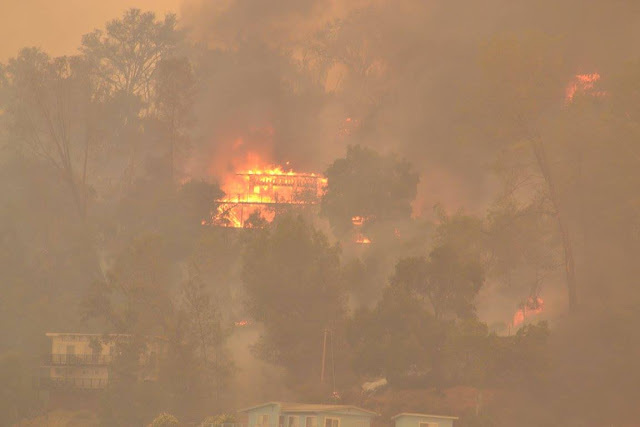 Trisha Butler of KSBY TV in San Luis Obispo captured extraordinary images of the Chimney Fire. 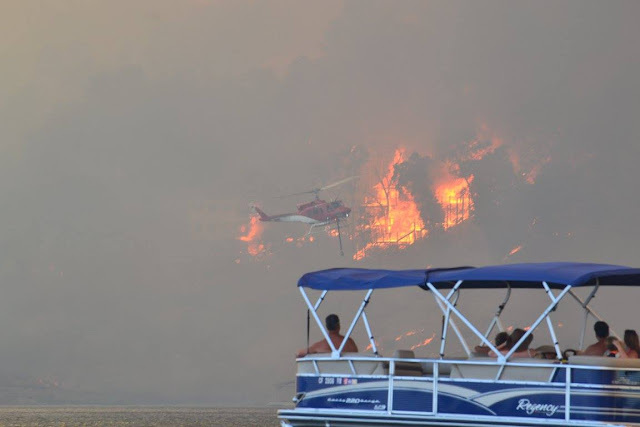 3,985 firefighters remain on the job. 325 engines, 116 hand crews, 4 air tankers and 16 helicopters continue to fight the erratic and stubborn fire including in rugged terrain. 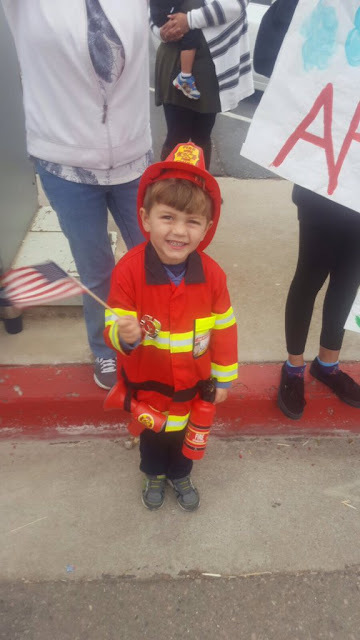 Citizens gathered in Paso Robles for a kind of thank you parade along the route that fire crews travel as they switched shifts. 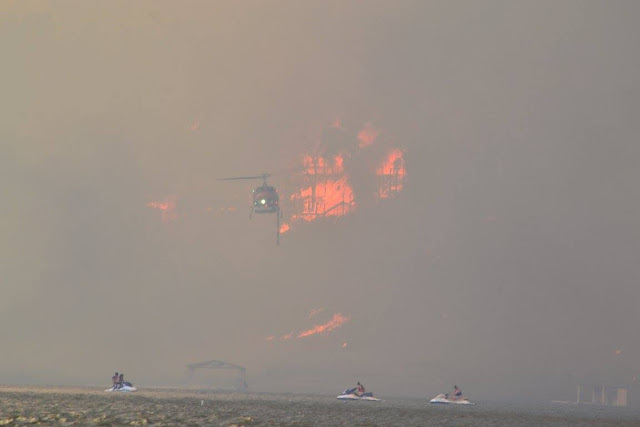 With thousands of firefighters and support personnel in the area they've made camp where they can. 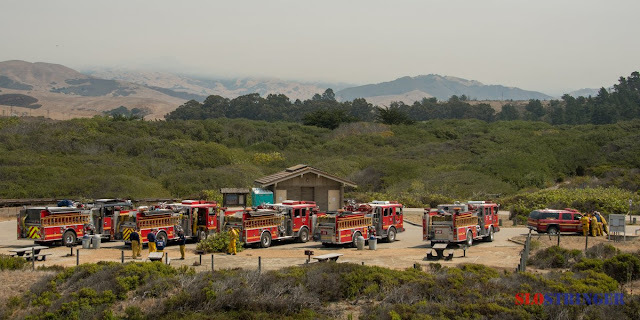 The image below is at the public use area of San Simeon Campground just north of Cambria. 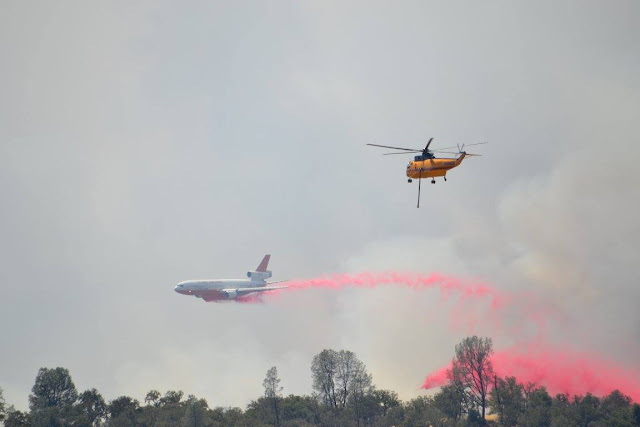 SLOSTRINGER has gathered incredible images of the Chimney Fire battle as you have seen in the last several posts. SLOSTRINGER has also gone the extra length to feed cats and dogs that were left by people who were forced to evacuate. Another great photographic presence has been EPN564. 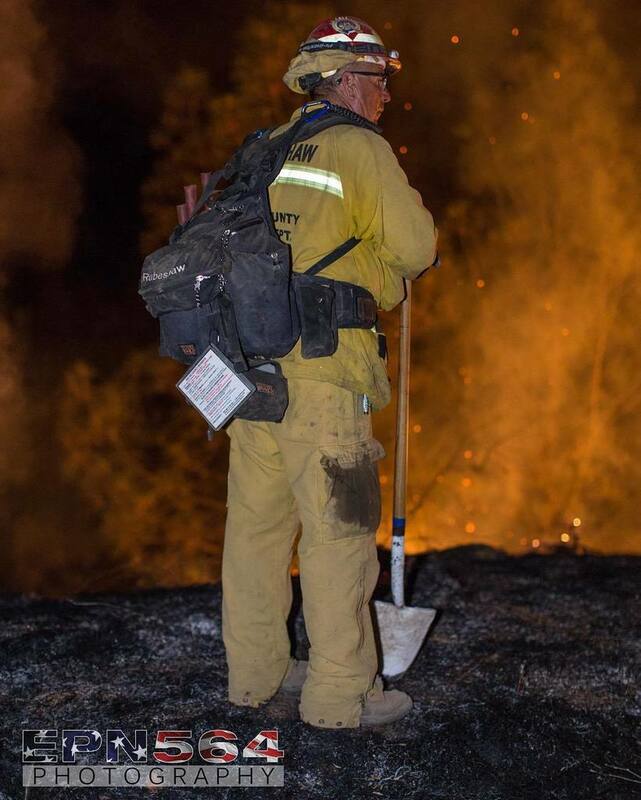 An LA Fire Captain observes as his team hand fights a part of the Chimney Fire. Air is slightly better and for that reason too people along the central California Coast are breathing a bit easier. Even though Hearst Castle remains threatened, it appears defensive efforts in place will hold. We are hopeful cooler and overcast conditions today and tomorrow will give the firefighters a chance to further contain the blaze, including those lobes that threaten Hearst and communities miles away on the north side of the fire. Browne performs For A Dancer and dedicates it a friend who passed two days ago. pay attention to the open sky. 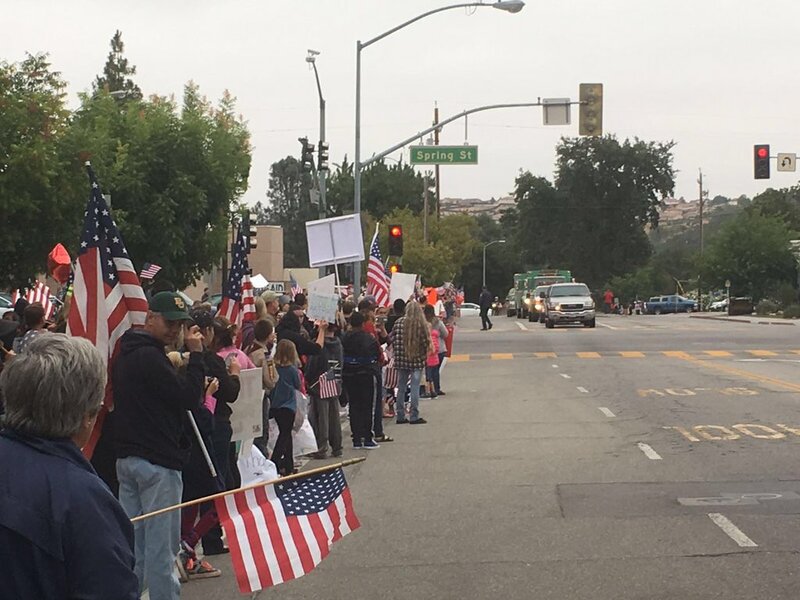 Browne got a rousing response when he paid tribute to the Firefighters. The audience cheered when he said "...some people build walls and others open doors." Browne has long been aligned with social justice and environmental causes, including in San Luis Obispo County. Lana and I have been fortunate to see Browne perform 6 times over the years and as Lana observed last night, "His music speaks to you. It goes directly to your heart." And he can rock it too! Last nite's crowd at Vina Robles were chilled by a stiff breeze, carrying evidence of the Chimney fire, but they were ready for some release and the troubadour delivered. And all the I had a chance to"
Something I don't want to forget to do is to again thank the heroic firefighters. Also to express admiration for journalists who have done admirable work. The San Luis Obispo Tribune and The Cambrian staff, including my friend Kathe Tanner have produced excellent reporting and coverage. KSBY and KCOY television are appreciated. SLOSTRINGER has provided extraordinary photo coverage. Praying for rain in California to help these magnificent firefighters contain this monster. Rain will be a blessing. I'm so glad the fire is being contained. I wish we didn't have to look forward to this as a year occurrence. Yes, it certainly does ring a bell. I was back in the mid-west but we covered nuclear protests. So how were those shared accommodations courtesy of your conscience and the sheriffs enforcement brigade? You were both on the right end of the spear. Tom, thanks for never stopping being a newsman...somewhere in the ether Fred is damn proud of you. I started aggregating elements of the fire coverage to post for friends back east, but in the last few days I've learned that many folks locally have plugged in as well. There sure are a lot more resources available now than when you and I had the AP and UPI wire machines, Metromedia Radio, Bob Hoover, Will Murphy and Bruce Taylor to build a news cast from. Those were fun days though. I remember Fred's admonition everyday before we headed out the door to the hit the streets with our cassette recorder-"Kill!" Scary out there. Much of the time I envy your location; now is not one of those times. Amazing how well Jackson Browne has held up vocally. Has been part of my soundtrack for 40-plus years. Locals are waiting for the rainy season this year. As for Jackson Browne, he said the other night he had been up in Utah and Oregon and was glad to be back "home." He spent a lot of time in the SLO County area as a youth and then as a young songwriter. His music has a durability, for sure.